In between homes, the TONE festival was kind enough to let Track Could Bend share its space at The Baby G for an extra-early outing before their event. A touch less intimate than the typical TCB surroundings (though brought in a little closer by bringing the action down off the stage), the trade-off was a chance to have an excellent sound-tech and a big PA to listen to some electroacoustic explorations. It's always a joy to have the series serve as a meeting place for emerging artists as well as those with a longer track record of enriching the city, so I was quite honoured to have sculptor and sound-shaper Barry Prophet in attendance. 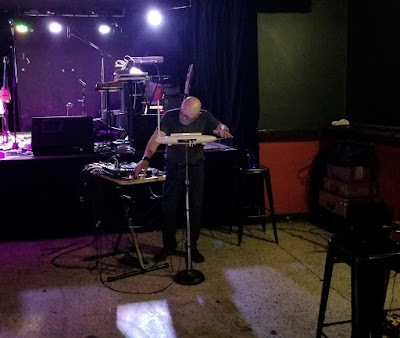 With his Moog theremin and sundry other electronics, Prophet created some very tasty oscillations, setting the tone for the night.